Jennifer Juan returns, to share her early onset midlife crisis, with her fifth major poetry collection, 27, With A White Lighter. A reflection of her life so far, and what the future holds, Juan muses over romance, the meaning of life, drug culture, sexuality, Brexit, and so much more. The collection includes the poem “Toyland”, a playful look at first loves and the dangers of romance, which was recently shortlisted for the Zealous.co “Zealous Stories: Poetry” competition. 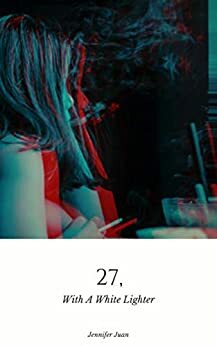 Full of contemplative verses, in her signature raw and empathetic style, Juan guides the reader through her most personal and reflective work yet, discussing the facts of life, from the perspective of an inquisitive millennial, toying with the past and looking towards the future.